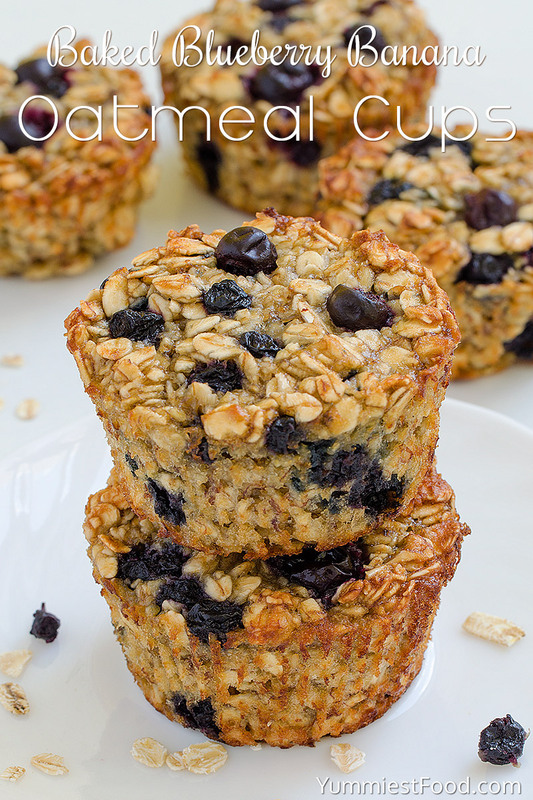 aked Blueberry Banana Oatmeal Cups – perfect and healthy way to start your day! Delicious, moist and not too sweet! Very easy to make, fast to eat and a good choice for every occasion! For these Baked Blueberry Banana Oatmeal Cups, I don’t have many words to say, except they are fantastic for breakfast or snack, and everybody like them. 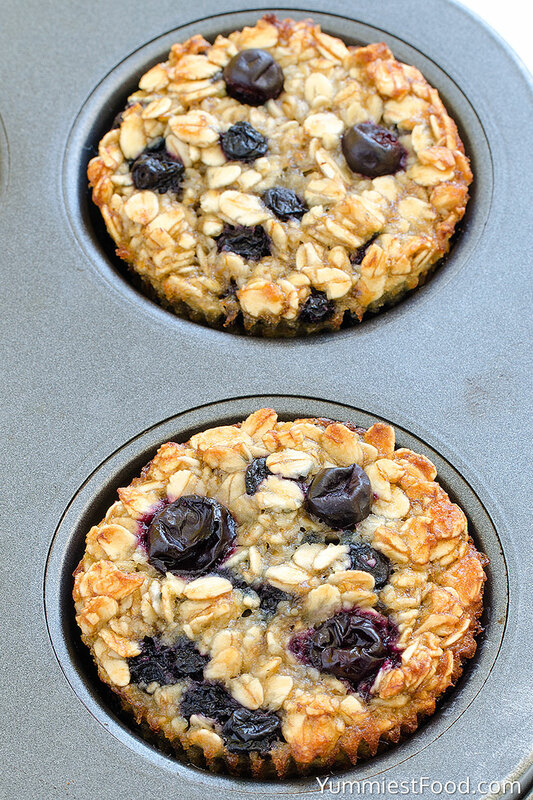 Baked Blueberry Banana Oatmeal Cups, very good choice to start your day! I usually have a problem that I don’t know what to prepare for a snack when my children go to school. 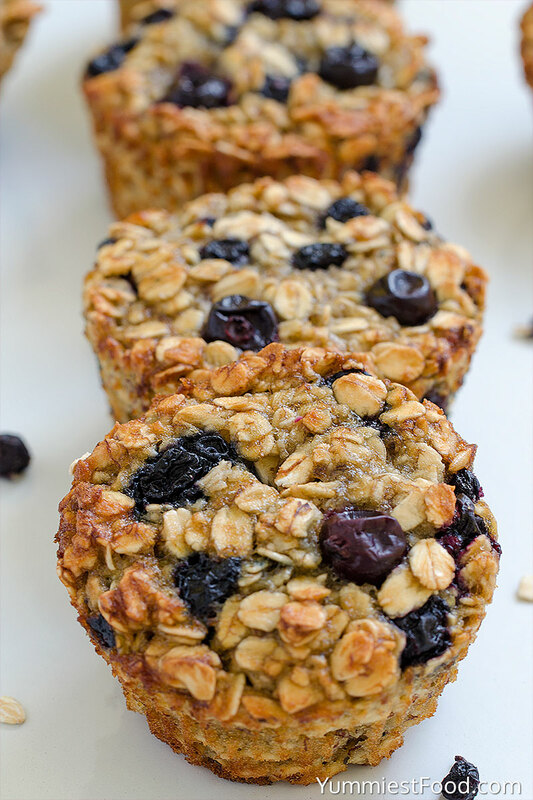 Fast food is something that we like, but these Baked Blueberry Banana Oatmeal Cups are healthy fast food. You only need to mix all the ingredients, add in the muffin pan and for a couple of minutes, you have your healthy snack or breakfast. Oats is a very healthy ingredient, and we need to eat it more because it has plenty of minerals and prevents obesity, it is very filling and healthy. Blueberries and bananas are also very healthy fruits. 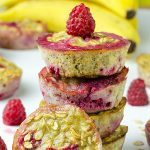 Sweet treat in muffin shape, perfect for every occasion and when you try to make these healthy cups, you will make it again and again. This is the first time I made this blueberry and banana combination and I am thrilled. I always taught that oatmeal cookies are pretty dry, but I don’t think that anymore. 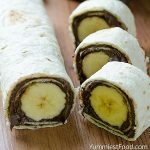 This Blueberry and Banana combination is perfect, and my family likes it the most! You can make them very easy and for a short time and I am sure that you are happy when your family is happy too, so try to make these healthy cups and be happy. Enjoy! 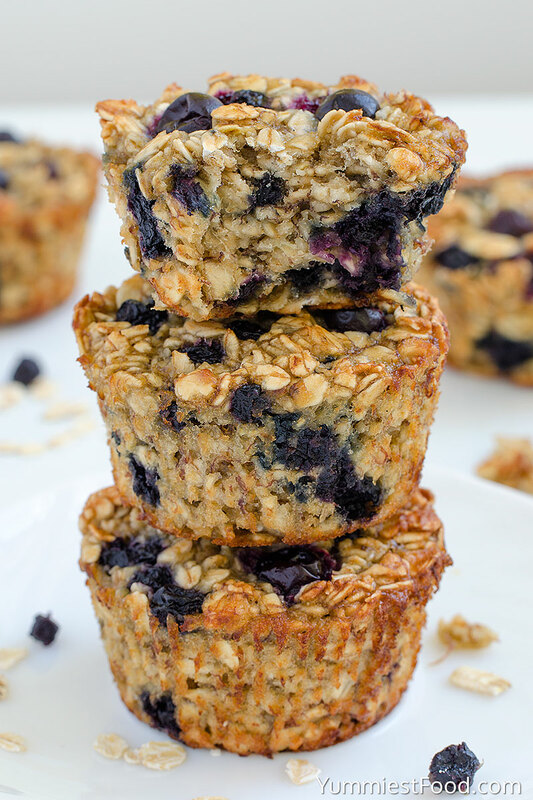 Baked Blueberry Banana Oatmeal Cups - perfect and healthy way to start your day! Delicious, moist and not too sweet! Very easy to make, fast to eat and good choice for every occasion! Line standard muffin pan with 12 liners and set aside. In a medium bowl, mash banana with a fork. Divide the batter into the prepared muffin pan and bake for 15 minutes. I just made 2 batches of these blueberries & banana muffins with a little xtra ingredient in it cinnamon . What a difference a little spice can do. Love them . Thanks for the recipe. !!! My 12 month old granddaughter has one of these for breakfast each morning. She loves them! Thanks for the recipe! I also added a bit of cinnamon. And I used 1/2 cup unsweetened applesauce and 1/2 cup brown sugar for the sweetner. I also just use one banana instead of two. Hi Saidah, there are nutrition values: Carbs 13.6g, Calories 76, Fat 1.6g, Saturated fat 0.3g, Fiber 1.4g, Sugar 4.8g, Protein 2.3g. Enjoy! Hi Wendy, these are nutritional info per muffin: Carbs 13.6g, Calories 76, Fat 1.6g, Saturated fat 0.3g, Fiber 1.4g, Sugar 4.8g, Protein 2.3g. Enjoy! Great recipe! I used 1/2 cup honey indstead of the brown sugar. Also added 1 tablespoon flax and chia & 1 teaspoon cinnamon. How much cinnamon did you put in? I just made these and they are so easy to make. I only had reg. oatmeal to use. I used splenda brown sugar. Next time i will cut down on the brown sugar. A little to sweet for me. But they are wonderful. I freeze bananas when they are getting to ripe just for things like this. How much cinnamon did you add? Hi Kristin, I don’t use cinnamon in this recipe, but you can add it if you want. Good luck! Yes that part was missing but I knew to do that but one other question, at the top of the recipe it says bake time 25 minutes but in the instructions it sates 15 minutes, which is the correct time? Hi Sonya, 25 minutes is the total time. 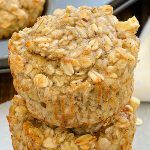 You need to bake these Oatmeal cups for 15 minutes. Enjoy! I’m wondering the same thing. I don’t see where it says what to do with the blueberries. Do you fold them in at the end? I just made a batch and they are very yummy but they fell apart so I’ll going to have to give it another try. Great for group breakfast! Thanks. Mine have also fallen apart – any advice? I’m wondering how well these freeze. Hi Lisa, you can freeze these oatmeal cups. The taste will be the same. Enjoy! These are delicious! ThanIs for the reciPe. Do you think You can freeze them? Hi Danielle, you can freeze these oatmeal cups. Thank you and enjoy! What can you replace the cup of sugar with? Would apple sauce work? Hi Karen, I haven’t tried without sugar, but I think apple sauce would work for this recipe. Good luck and enjoy! Did you use honey? Where they successful? These look great. I’m wondering, though, if the oats need to be cooked before mixing with other ingredients and then baking? Or do they get added dry? Hi Dan, you need to add dry oats. Thank you and enjoy! At the top this says bake time is 25 min, but in the recipe it says 15. Which is it? Hi Linda, 25 minutes is the total time. You need to bake these Oatmeal cups for 15 minutes. Enjoy! This looks wonderful. I am really trying to watch my added sugars. Do you think adding more banana in place of the brown sugar would work? Hi, you can make these oatmeal cups without sugar. Good luck and enjoy! An odd question – what might be substituted for the bananas? Hi Barbara, I really don’t know, I always make them with bananas. Good luck! Did you make them without banana? I would like to know how they turned out as I’m not a big fan of bananas in oatmeal. How much pumpkin do you use? Hi !!! I HATE bananas and I always add zucchini (2) / apple / carrot / spinach and 3/4 cup of non fat Greek yogurt to make up for the moist in the banana good luck !! What is the carb count on these? Hi Vera, these are nutritional info per muffin: Carbs 13.6g, Calories 76, Fat 1.6g, Saturated fat 0.3g, Fiber 1.4g, Sugar 4.8g, Protein 2.3g. Enjoy! It says 2 eggs on the ingredients list but only mentions one on the instructions. Which one is it. Hi, you need 2 eggs for this recipe. Good luck and enjoy! Can you make them without eggs? Hi Maria, You can use a “flax egg” or “chia egg” here. I’ve tried both and they work fine, or you can try 1/2 cup applesauce! Instead of blueberries I would like to use walnuts and cinnamon how do you think will turned out ? Hi Mercedes, you can use walnuts and cinnamon is always a good idea for oatmeal cups. Good luck! I’m trying to eliminate processed foods & refined sugar from my diet, any suggestions as to what I can replace the sugar with? Hi Heather, you can make these cups without sugar. Enjoy! I make something similar and basically you can add any fruit. I add pears as they’re sweet but I don’t use sugar. adding walnuts sounds good think I’ll try that. Also add 0% day Greek yogurt as I don’t use banana. Thanks for the recipe Lidia. Hi, these are nutritional info per muffin: Carbs 13.6g, Calories 76, Fat 1.6g, Saturated fat 0.3g, Fiber 1.4g, Sugar 4.8g, Protein 2.3g. Enjoy! I entered the recipe into the recipe builder on the WW app, they come up to 5sp per cup if you spread it between all 12 muffin cups! Perfect for breakfast! As a Weight Watchers member, do you know how many points one muffin is? Also how many muffins does this recipe make? Thank you. Hi Linda, you can get 10 muffins on this recipe. These are nutritional info per muffin: Calories 76, Fat 1.6g, Saturated fat 0.3g, Carbs 13.6g, Fiber 1.4g, Sugar 4.8g, Protein 2.3g. Enjoy! How do you store these and do they freeze well? Hi Jackie, I stored them in an airtight container in the fridge and you can also freeze them. The taste will be the same. Enjoy! I took an educated guess as to when to add the blueberries to the recipe since your recipe above does not include this step. Hi Sherie! Blueberries need to be added with the other ingredients. Enjoy! I’m making these again. I thought for sure you would edit your recipe and include when the darn blueberries are added!!!! Hi Laura, you can get 12 muffins. Enjoy! Hi Lidia, I’m excited to make these, they look fantastic! A bit confused about the calories per muffin. Is it based on a batch of 10 or 12 muffins? Thanks so much! Hi Carol, it is based on a 12 muffins. Enjoy! Thank you! Can u make bars instead of cups…. Yes, of course you can. Enjoy! What is the best way to store these after making them? Hi Shannon, you can store them in the refrigerator to enjoy throughout the week.You can also freeze them and then heat them up real quick in the microwave for a quick and easy breakfast to take on the go. Enjoy! I make these weekly. Instead of a full cup of brown sugar I use half and half of truvea. I alnerate my fruits. This week I used apples and raisins. Love these muffins! Thanks so much for this great recipe. My husband and all my co-workers loved these. All the healthy ingredients and having them ready to grab for a quick breakfast make these a new favorite. You’re welcome Patti! 🙂 Thanks for sharing this nice comment! Hi, i just noticed that in the instructions section, you had forgotten to say to add the blueberries’ was a bit confused. Hi Bob, you are right. You need to add blueberries after mixing. Good luck and enjoy! I have made them and they are delicious and easy for in the run breakfast. I also added 1/2 cup of flax seed to mine, they are delicious! I made these and ended up using 1/2 cup of coconut sugar and it was a bit too sweet. I think I would use honey next time to make it a little healthier. Otherwise, they are delicious. I’m sure they’re really good with the brown sugar but I try to keep things a little better for me nowadays, would have given 5 stars if they were. I used the cinnamon and it was a really good addition, totally agree with the commenters. All in all, very tasty and will totally make them again this week. Forgot to mention I used Coconut Sugar instead of the brown sugar. It was still delicious. You’re very welcome! 🙂 I’m glad you like it! Thanks for sharing this nice comment! The recipe calls for blueberries, but when do you add them? Do you mash them with the banana or fold them in before dividing into the muffin pan? Hi Missy, you are right, you need to add blueberries after mixing. Enjoy! These sound great and I’m going to try them, but I think your calorie count is low by about half. The brown sugar adds more than 800 calories to the total recipe. I calculated 156 cal/muffin. Still acceptable, but I’ll probably reduce the sugar by at least half for my taste. I also think cinnamon would be great in this recipe! Hi Val, cinnamon is always a good idea for oatmeal cups. Good luck! Awesome recipe thank you!!! Made a couple of different batches and the ease makes this a quick go to for healthier treats. Thank you for posting this recipe. It was easy, delicious & healthy. I made a few changes & wanted share. My updates are: 3 frozen (really ripe) bananas. 2 bananas were small, 1 was medium. 2c quick oats (I was out of old fashioned) 2 eggs. 1/2c local honey. 1t baking powder. 1t vanilla. Heaping 1/2t cinnamon. 1c fresh blueberries. Appx 2/3-3/4c chopped walnuts. Baked at 425 for 15 minutes. Made 10 muffins. Thank you for the great modifications! I added a pinch of cinnamon, chia seeds and pecans. Delicious!!! Loved the idea but way too much sugar. I may try this again with half the sugar and some nuts. You’re very welcome Sandy! 🙂 I’m glad that you like the recipe! You’re very welcome Melanie! 🙂 I’m glad that you like the recipe! Hi Ang, eggs are the binder so they probably won’t stay together without them. I’m not familiar with egg substitutes. Tastes wise they’ll be okay without eggs, they will just probably not stick together. Hi Lori, Yes these cups are gluten free. Enjoy! I added the grated rind of a lemon and 2 TBSP of lemon juice. Yum. Delicious, but I baked too long. Cook time at top of recipe says 25 mins. & at end of recipe says 15 mins. A bit misleading for me. Will definitely try again & bake 15 mins. I don’t have the liners is it OK to use without them? They look good! Hi Jean, You can make bars instead of cups. Good luck and enjoy! These are great. I add a little bit of cinnamon. I also reduce brown sugar a little to add a little maple syrup. It’s super easy to make more than one type by replacing the blueberries with a cup of topping. You’re very welcome Sarah! 🙂 Thank you for such a nice comment! I’m glad that you like the recipe! I am diabetic and trying to eat healthier. I am not a breakfast person but these sound petfect. Thanks so much for sharing the recipe. You’re very welcome Paulette! 🙂 Thank you for such a nice comment and I’m glad that you like the recipe! Love this recipe!! I use coconut (palm) sugar instead of brown sugar and they taste just as sweet to me as when I tried the recipe with brown sugar. I also use Bob’s Red Mill Gluten Free oats and it turns out great. I’m glad that you like the recipe! 🙂 It’s a great idea to use coconut (palm) sugar instead of brown sugar! Thank you for such a nice comment Lauren! These are so delicious and will definitely be making them often!! I need some help with this recipe because when I put it into my diet app it says each muffin is a little over 200 calories each. I am having trouble with figuring out how you are doing it to get it to how each muffin is only 76 calories. I have a screenshot to show all of the ingredients individually and their calorie totals as well as how much each serving is calorie wise. The Brown sugar is about 1400 calories and the oats are a little more than 600 calories for the entire recipe total and I divided it all by 12. Then adding the egg, banana and other stuff adds a ton more. Hi! Just wondering if it is okay to use quick oats instead of the old fashioned rolled oats?? Thank you in advance, excited to try them!! I add a 1/2 cup of chopped pecans, it gives you a crunch and added deliciousness! These were delicious, thank you! I am new to baking & thought this might not work without flour; silly me. 😉 20 minutes in my oven and they were perfect. Thanks again. You’re very welcome Pamela! 🙂 I’m glad that you like the recipe! Love these! I used dark coconut sugar and added chopped pecans and cinnamon. I’m a novice baker but I made these last night and they were delicious! I kept them in the oven a few minutes longer than recipe indicated (probably 18 minutes) and they were still almost too moist on the bottom half. Still edible but not as perfect as they should have been. I wonder if it might be due to using foil baking cups (without paper liner) and/or old baking powder? I also wondered if these it’s a bad idea to do them without a baking cup, just right in the muffin pan? Hi Douglas, I wouldn’t suggest it unless you spray the muffin liners because baked oatmeal tends to stick to them. Do you think they’d come out the same if I substituted honey for brown sugar? If it’s been tried how much honey should be used? Hi Teri, I haven’t tried without sugar, but I think honey would work. I would use 1/2 – 1/3 cup. Good luck and enjoy! You’re very welcome, Hilda! 🙂 Thank you for such a nice comment! What is the best way to store these?? Just made them, they are delicious!!!! Hi Heather, you can store them in the refrigerator to enjoy throughout the week. You can also freeze them and then heat them up real quick in the microwave for a quick and easy breakfast to take on the go. Enjoy! Sweet jesus these are good! Only thing I’m not digging is the amount of sugar added. Want to make them next time with half the amount and maybe stevia to make up for the rest. Also add some flax or chia to the mix. Thanks for the recipe!! You’re very welcome, Traci! 🙂 I’m glad you like the recipe! Anyone use something other than bananas? I hate the flavor of bananas. Thanks!